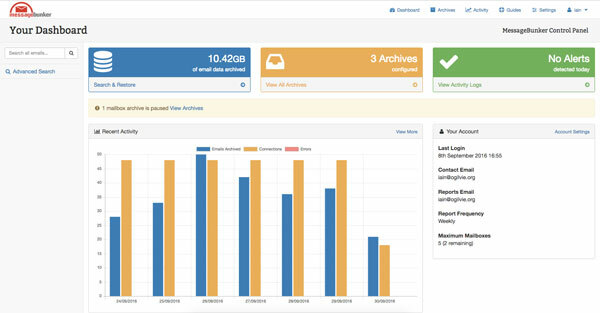 In-the-Cloud email archiving and discovery – made simple! Ever lost an important email? Email is the life-blood of any organisation so it’s imperative that your email is backed up in a safe place – not only to meet legal compliance, but also for your own sanity. MessageBunker provides a simple, secure, in-the-cloud email archiving and discovery platform that won’t break the bank! MessageBunker now works seamlessly with Gmail! MessageBunker stores directly within Outlook. MessageBunker provides the perfect partner to Office 365 (enterprise). MessageBunker now works seamlessly with Gmail. Access MessageBunker via iPhones and Android devices in an iOS-style interface. Works with any publicly addressable POP3 or IMAP server. Access wherever you have Internet access: ideal for disaster recovery. Search through text and a huge number of attachment formats. See your inbox as it was at any point in time since archiving began. Restore archived emails direct to your mail account. The ideal migration tool simply archive and restore to your new server. from only £2.00 per month. More info and Free Trial! MailCore Pro: email hosting and office collaboration service: providing email, shared calendars, contacts, files and notes – anti-virus and anti-spam filtering as standard.